C1661. 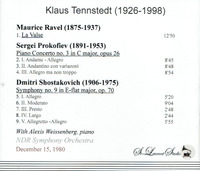 KLAUS TENNSTEDT Cond. NDR S.O. : La Valse (Ravel) [most assuredly the most beguiling performance of 'La Valse' you're likely to hear! 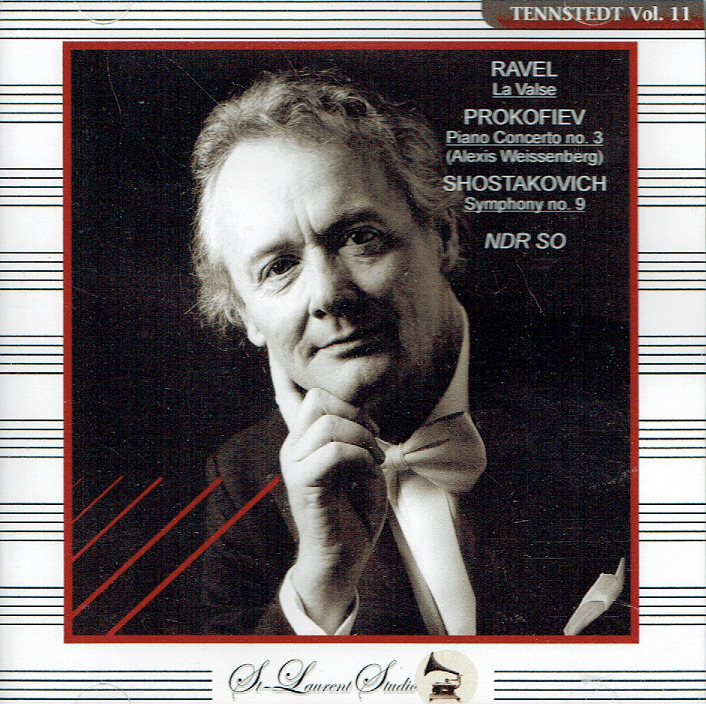 ]; Symphony #9 in E-flat (Shostakovich); w.ALEXIS WEISSENBERG: Piano Concerto #3 in C (Prokofiev). [Among the most glorious of Yves St Laurent's achievements - magnificent performances in stunning sound!] (Canada) St Laurent Studio YSL T-731, Live Performance, 15 Dec., 1980. Transfers by Yves St Laurent. Mr. Weissenberg’s cool yet blazing approach divided reviewers. Where some heard impeccable technique, others heard soulless efficiency. Where some embraced the drama of his interpretations, others condemned them for aggressiveness. 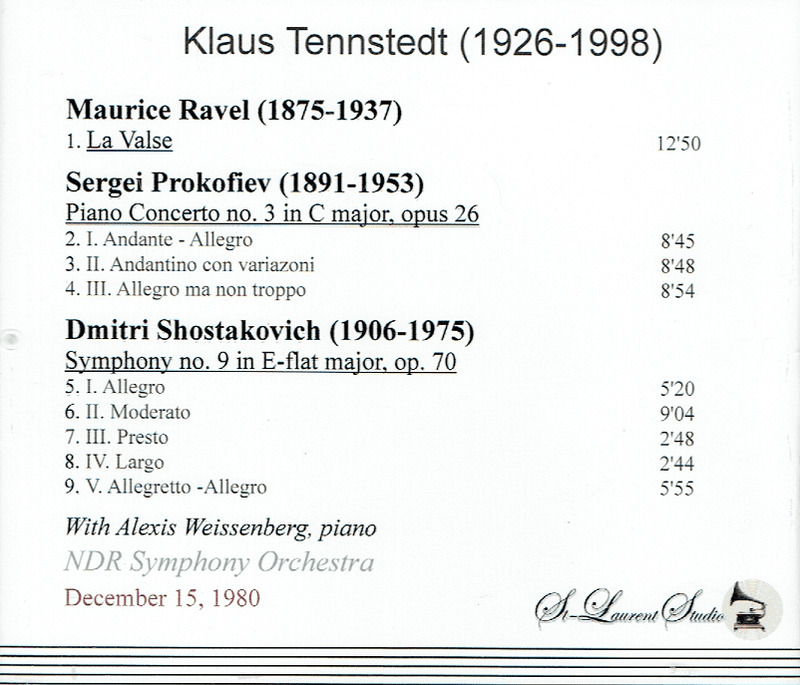 On these points, however, nearly everyone agreed: Mr. Weissenberg possessed a technical prowess rivaled by few other pianists. The ice of his demeanor at the keyboard (he sat, leaned forward and got down to business, playing with scarcely a smile or grimace) was matched by the fire that came off the keys. He could play very fast, and very loud. (Over time, verbs used to characterize his pianism included ‘barrel’, ‘tear’, ‘thunder’ and ‘let loose’). Reviewing a 1982 Carnegie Hall recital by Mr. Weissenberg, in THE NEW YORK TIMES Bernard Holland called his rendition of Bach’s Chromatic Fantasy ‘chillingly scientific’. He added: ‘It was anatomy instruction conducted by a master — a brilliant dissection of cold, gray, gleaming flesh, from which every trace of living blood had been conscientiously squeezed away’. To his critics, Mr. Weissenberg had no shortage of articulate rejoinders. In a 1983 interview with THE GLOBE AND MAIL OF CANADA, he had this to say about his unemotional stage demeanor: ‘You cannot lose your control physically and be precise as to what your hands do. Can you imagine a surgeon operating on somebody, and swooning and looking up at the ceiling and being very excited about it? The patient would die. That is what happens in music too. The patient dies, because there’s too much going on besides the actual performance’. In the mid-1950s, Mr. Weissenberg moved to France. By then, critical opinion had begun to dog him, and engagements on major stages were drying up. He took a long sabbatical from public performance, spending a decade teaching and studying. ‘As a young artist I learned new works very fast and played them much too soon’, he told NEWSWEEK in 1977. ‘In 10 years I would have reached a point where my whole repertory would have been overplayed and understudied. I did not want to end up at the age of 50 still a ‘promising’ pianist’. He re-emerged in the mid-1960s, and by the 1970s was again performing widely.